Starting a new Business venture/ Want to form a new Company, don’t know how to go about it, confused about the optimum structure of starting business, We have the Solution for you. We have a rich experience as business advisors and financial consultants to plan and oversee the implementation of business initiation plans. The key focus of these services is to assist enterprises to enter the Indian market, set up a new business entity, and assist in handling the entire back office operations. Consulting about the most preferred structure for starting the business in the specific circumstances of the client - to start up as a Pvt limited company/ Partnership firm/ Proprietorship/ Limited Liability Partnership/ Trust/ Society. Regulatory approvals Including Foreign Investment Promotion Board (FIPB), Reserve Bank of India (RBI), Secretariat of Industrial Approval (SIA), Registrar of Companies (ROC) and other concerned authorities. Obtaining registrations and permissions like sales Tax (VAT) Registrations, Import Export Code, Excise Registrations, Income Tax PAN, STPI etc required to commence business operations in India. Representative office and nominee director Facility. Support in Accounting and Payroll management. 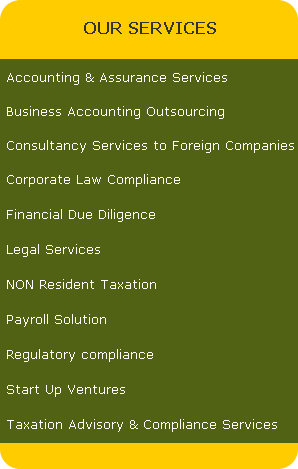 Regulatory Compliances covering Tax compliance and advisory management services, corporate, secretarial, financial services etc. Apart from the Company incorporation we also assist our clients in formation of other legal entities like Non Government Organisations like Trust, Charitable Foundation, and Educational Society etc.